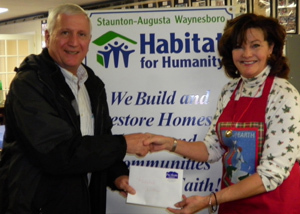 Dennis Stepp of ProSure Insurance in Staunton delivers an unusual Christmas gift to SAW Habitat Executive Director Rhonda Howdyshell. The staff at ProSure Insurance decided to make donations to SAW Habitat instead of giving each other Christmas gifts. SAW Habitat has been doing honorary alternative holiday cards with local churches and individuals for many years, but this marks the first alternative business Christmas gift program.